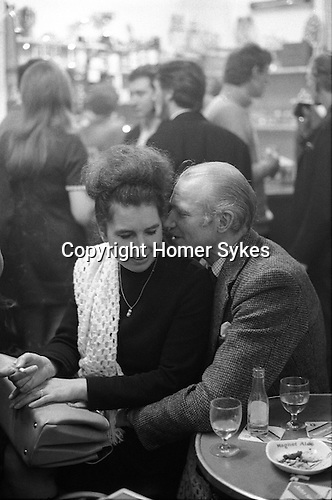 WHISPERING SWEET NOTHING COUPLE OF MIILE AGE LOVERS TOGETHER LINCOLNSHIRE UK 1970S. A tweed jacketed middle aged lothario with his hair brylcreemed flat straight back, places his hand in his lovers crotch; discreetly hidden by her handbag. Sitting on his knee, he whisperers sweet nothings, oblivious to the Kings Arms pub regulars crowded all around.